We picked this book to read for April for the St. Anastasia Book Club mostly because I had just seen the movie “Of Gods and Men,” which was excellent. The book is great for giving additional information to support the movie. 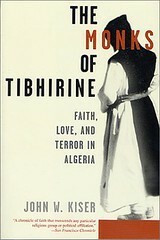 It spends a lot of time speaking of the political atmosphere in Algeria, of the various factions and of the religious aspect to the conflict. This made for some dry reading, but it was useful, if you were looking for a comprehensive understanding of the situation the monks were in. Personally, I wasn’t as interested in that part so much as the lives of the monks themselves. While the majority of the attention seemed to be on Christian, the elected prior, each of the monks was revealed in the book. By the end, you really knew them: their personalities, likes, struggles, and a little bit of what Tibhirine and the Islamic community around them meant to them. Throughout the book were passages which are worthy of copying down and praying with. The lives of these monks teach us so much about community, love, living the faith, dealing with people with different viewpoints with love, and courage. Below, I’ll quote some of the passages I found particularly inspiring. I’m sorry that I don’t have page numbers for you, as I read the e-book, but if you have the Amazon Kindle version, I’ll cite the location code. How important is this for us to remember, especially as Catholics whose liturgies, with minor deviations, follow a certain formula. It is easy for our participation in Mass, and even our prayers and devotions, to become rote and mechanical — lacking in true feeling and the engagement of our spirit. How necessary is it that we focus and really pay attention to what it is that we are doing. I love this: “prayer of the heart.” It has been pointed out to me that studying faith without having faith yourself is merely “religious studies.” If you truly want to be a theologian, you must live the faith. Mind, body and soul. There is no disunity in the Body of Christ. “Let’s talk about the cross,” the Sufi said. “Perhaps three, certainly two,” the Sufi replied, thinking a bit. “Which comes from God?” I asked him. “The one in front,” he said. “And the other?” I asked. This was just beautiful. I don’t think I’ll be able to look at a crucifix in quite the same way again. I don’t think that this in any way should lessen our reverence for the cross [thinking of the way we kiss the wood of the cross during Good Friday devotions], but rather be thankful for it. God was there for us all along, with His arms outstretched, waiting for us to walk into the embrace which was being freely offered to us. However, we were unable to see His posture of love until the cross brought this into relief. It is because of the cross that we are able to see the love of God. What a way to love one’s enemies! In this, Christian isn’t even “loving one’s enemy,” but truly seeing that enemy as not an enemy at all, but a brother. Amen! Just see what is happening in our culture with its widespread secularization. I think we need to keep this in mind. There are a lot of people who are quick to demonize all Muslims for the transgressions of a few, who may not be living out the Islamic faith as it is meant to be lived. They cause scandal by their actions. As Catholics, we are far too often guilty of this ourselves. There are many times where our example, our lives, are not consonant with the teachings of the Church and we too give scandal and give a bad impression of what it means to be a Catholic. Pride, rearing its ugly head. Would that this passage stay with me during all the times of trial in my life. This is a photo of the graves of the kidnapped and murdered monks.